It’s 1945 and soldiers in the US Army are about to shake hands with their Russian counterparts for the first time in Nazi Germany, the land they defeated together. The average GI didn’t know much about the Soviets except for the news/propaganda they’d consumed before and during the war. So how did the War Department deal with what was to be a meeting of WW2’s biggest allies? Imagine all those GIs holding War Department Pamphlet No. 21-30 with its red cover and the hammer and sickle: our Red Army ally. It’s a 77-page illustrated booklet giving the GI the lowdown about Soviet army practices, uniforms and insignia, weaponry, language and other interesting tidbits. It’s not terribly easy to find information in English about regular Soviet soldiers and their everyday lives, so this booklet is a real find. The Cold War was pretty much over when I was growing up in the United States, but I do remember the Soviet Union being accused of being a part of some vague axis of evil. That’s why I was so struck by how positive our Red Army ally was about the Soviets. I don’t think I’ve ever read or seen a US government source that attempted to be so fair and understanding about them. He is your friend. He is your ally. He has fought hard in this war, just as you have. . . . Elsewhere, the GI learns that Red Army discipline is strict, that soldiers make do with much less than what GIs have, and that off duty Soviets play dominoes and chess or read Pushkin. This lesson in humanizing the Soviets continues under the section “Why He Fights,” where the booklet argues Soviet soldiers are just the same as American ones. They want to live a peaceful life in their homelands, but in the Soviet case, they had to mobilize to defeat the brutal enemy that killed millions in the Soviet Union. The Red Army’s oath is even printed so the GI understands what ideal his counterpart aspires to. My favorite section was on p. 6 when GIs are informed about Soviet women in combat. I was surprised women got a whole paragraph describing their work and the fact that some became commanders of combat formations. Don’t be surprised if that tank commander turns out to be a personable young sergeant named ‘Masha’ (a popular nickname for girls). Though apparently some of the language advice in the booklet is a bit shaky, the information as a whole is golden, especially the many color illustrations. I was also impressed at the little glimpses the booklet gave into everyday life of Soviet soldiers. But most impressive was seeing the massive attitude shift in the US government ahead of the monumental task of occupying the defeated Nazi Germany with its militarily strongest ally — and its biggest threat — the Soviet Union. Here in Germany, my kids aren’t old enough to learn about the Nazi era in school yet. So I recently jumped at the chance to see what high school-age students were doing. It’s hard enough getting young people interested in all that old stuff. And anything short of virtual reality probably wouldn’t impress them, right? So off I went to what the press was calling a “lecture performance” of 12th graders from the Burggymnasium in Essen. The venue piqued my interest too; the performance took place in the wartime air raid bunker under the city archive. But first we crowded into the archive’s foyer in front of a table where two students in blouses and braided hair sat working. Cheerful period music was echoing in the hall, and it made me feel a little uneasy. We were there to learn about forced labor in wartime Germany – hardly cheerful. In clipped tones, the students called for us to get in line. It was dawning on some of us that the performance had already started. When we entered the building, we were handed a card with a number and had been told it would be used to divide up the groups since the bunker space was so small. But once we got to the table in the foyer, we gave up the first number and were given another — mine was 721 — written on white tape. “Wear it in a visible place,” they told us. I slapped mine on my coat without asking what the number was for. I had a pretty good idea. Numbered, I had to walk alone between two students in white shirts and dark pants. They stood at the foot of the stairway leading down to the basement. They held file folders, and as each of us walked by, they said in a bland tone, “Follow the directions.” Always this firm, impersonal tone. I was impressed and a little uneasy the students managed it so well. In the narrow basement hallway, more students in white ordered us to go right or left. I joined the group waiting quietly in the right-hand hall. Maybe the others felt the same way I did, caught off balance by how quickly we obeyed what seemed like random orders. A door opened. This wasn’t the bunker yet, but a medium-sized room where thirty of us crowded inside. The windows were covered for the blackout. There were students in white shirts at a table with a scale, some bread and a cooking pot. There were students in baggy or shabby clothes lined up, their heads bowed. The “man in charge” talked to us then, complained about how hard it was to feed these people — the shabby ones, the Ukrainians dragged to Germany to work. When he had a question for us, he barked, “How much did a slave worker eat per day, number 721?” We looked down at the numbers on our coats, trying to remember who (what?!) we were. He talked about duty, and how if he wasn’t firm, if he failed in his duty, his own family would suffer. At which point he gave one of the student-slaves a mock kick and walked off. The slaves spoke too — at first about home. How much they missed it, how their home gave them strength to endure. One scrubbed the floor as she talked about her fear of getting sick, of not being able to work anymore. It was uncomfortable having to look down on her the whole time. An air raid and sudden darkness, and we were evacuated out of the room. To the bunker. Through a narrow door, we climbed into a nest of rooms with bare and dusty walls. Here and there, someone had stenciled the capacity the rooms had — 25 people, for instance, in a space too small to be comfortable. As we wandered from room to room, students acting as slaves told their stories of being snatched from their villages in the Ukraine or Russia. The journey to Germany in freight trains and the yearning for fresh air, space and freedom. Their work — sometimes with German families who treated them kindly; more often in factories, especially in Essen, where they were worked to exhaustion or death. Two students were closed into a replica of the famous steel locker used as an isolation cell and punishment for forced labor. There was poetry and artwork and period photos beamed on the walls. A group of students sang about home in German and Russian to a guitar accompaniment. When we left the claustrophobic nooks and crannies of the bunker, the performance was over. My first thought was — these 12th graders put together one of the most informative and moving bit of living history I’d ever experienced. They had studied the testimony of forced labor and the Germans in charge of them to understand what went on in their own words. Students who spoke Russian translated some documents fully into German for the first time. But it was the performance itself, creating it, writing it and performing, that brought the students closer to the tens of thousands of slave workers forced to come to Essen more than 70 years ago. An excellent performance and a great experience. Bravo. It’s been 69 years since World War 2 ended. The German military capitulated to the western allies, but the main signatures were done in Berlin, in the Soviet HQ in Karlshorst. The German-Russian Museum is there now. Today the Russian ambassador to Germany and a Ukrainian diplomat are scheduled to toast the anniversary. A toast for peace — a big gesture, considering what’s been going on in the Ukraine lately. This goes to show how alive World War 2 is for the former Soviet Union. No wonder — 27 million of their people died. When it was finally over, on the night of May 8 and 9, 1945, there was a party to end all parties. It took place in a room you can see if you head to the German-Russian Museum. 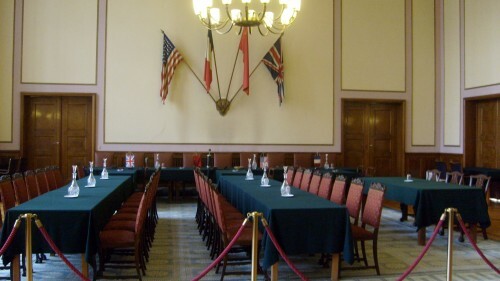 The hall where the capitulation was signed is preserved as it was, the flags of the 4 allied powers on the wall, the tables arranged as they were on that fateful night. 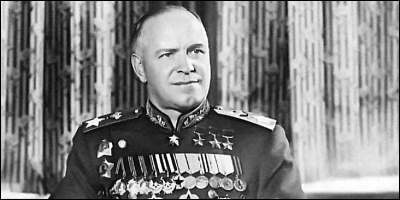 Alcohol flowed – no big surprise when the Russians were throwing the bash — and apparently General Schukow himself did some fancy dancing. Of course, the Germans of the time had nothing to celebrate. Even people grateful for peace — and most were after 6 years of war — lived in shock, helplessness and blatant fear. Especially in Berlin, May 8 was the start (or the continuation) of a horrendous time for German women and girls raped and assaulted by mostly Russian soldiers. The city smoldered after the Battle of Berlin. There was no order, no government, no safety. A time of chaos. But the deadliest war in history was over. A moment to celebrate.